This covers the modern art collections at the Museu Nacional d'Art de Catalunya, 'modern' in this case specifically meaning Catalan art from the great awakening moments of the Renaixença to the advent of Franco and the Civil War. As of 2014, the collection has been arranged according to four themes: the Modern Arts, Modernisme, Noucentism (the post-First World War reaction to the decorative, 'irrational' aspects of Modernisme and desire to 'return to order', and Art and Civil War. Some of the biggest works are by Marià Fortuny (1838–74), the leading painter in Catalonia and Spain painter of the mid-19th century. His virtuoso Vicaria wowed them in Rome, where he spent most of his short life: exotic and mysterious, with shimmering coloured costumes. The Disputació de Barcelona sent him to Morocco in 1860 to draw battle scenes: the result was his enormous Battle of Tetuan (1863), full of the dust and chaos of war, honouring the 500 Catalan volunteers who fought under General Prim. 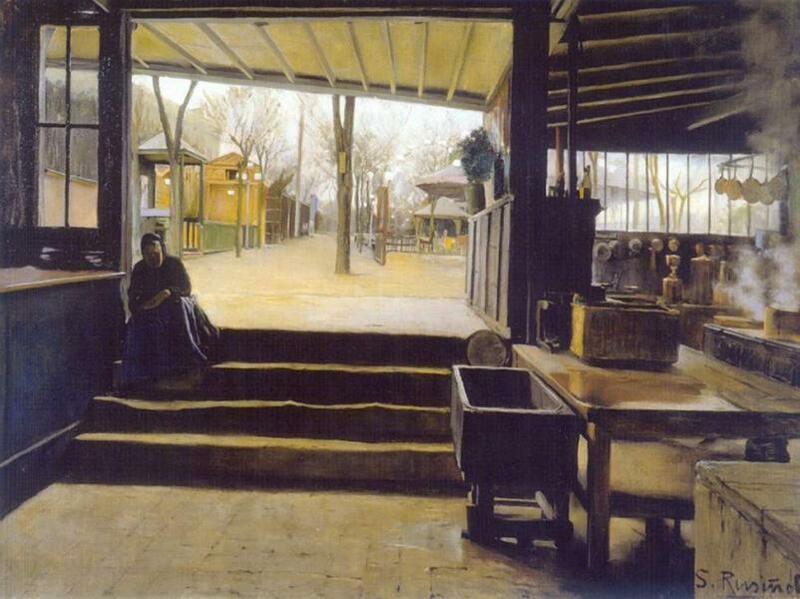 Non-idealized Realism, Courbet-style, was introduced to Barcelona by Ramon Martí i Alsina, who painted evocative street and market scenes of Barcelona. Joaquim Vayreda (1843–94) was the leader of the Olot School (centred on the town of Olot in northern Catalonia) which specialized in landscapes, rural scenes and pious farmers inspired by Millet and the Renaixença. By the end of the century, however, Realism had evolved into narrative Anecdotisme, which the public adored. Key figures were Romà Ribera, who had a touch for textures, and Joan Roig i Solé (of the umbrella lady fame) and Arcadi Mas i Fontdevila, both of Sitges, who painted bright seascapes and fishermen, and were believed (at least in Barcelona) to be in the vanguard of Impressionism; see Roig’s singular Smoking Pot on the Beach at Sitges. Then came the Modernistas, led by Ramon Casas. The museum has his famous Tandem Bike Self-Portrait painted for Els Quatre Gats – that’s Casas pedalling hard in front and the buck-toothed Pere Romeu coasting behind. It also has his remarkable, almost photographic, Corpus Procession Leaving Santa Maria del Mar (1898), painted two years after the Anarchist bombing just outside the church. Other works are by his friend Santiago Rusinyol, who also delighted in shocking the bourgeoisie, but more in his life than his painting. The leading Modernista sculptors — Josep Llimona, Miquel Blay and Eusebi Arnau — are equally represented, although the last left his best works scampering on buildings. There's an excellent collection of Modernista furniture designed by Gaudí and Puig for the houses they built, and exquisite pieces by Gaspar Homar for Domènech’s Casa Lleó Morera. A Modernista private chapel built for Joan Busquets from the Casa Cendoya on the Passeig de Gràcia has been preserved, a rare survivor — most were destroyed during the Civil War. Later Modernista painters (‘the Second Generation’) were more expressionist in outlook: Isidre Nonell, Francesc Gimeno, a tormented soul who produced deeply textured landscapes, and Joaquim Mir, who worked in bold patterns of colour, as in his voluptuous stained-glass screen. The Noucentista reaction is represented by a Cézanne-inspired search for structure, harmony and pure forms, in the paintings by Joaquim Sunyer of Sitges, Joaquim Torres-Garcia and in the classicizing sculpture of Josep Clarà. Of the artists of the 1920s and 30s, there's sculptures by Pau Gargallo, a chameleon of many styles and wit, who did much of the decorative work on the Estadi Olímpic and experimental works in iron ‘drawn in space’ by the innovator Juli González, who only turned to sculpture at age 50 after a career as a metal worker; he later taught Picasso how to weld. Perhaps most compelling of all is Salvador Dalí’s Portrait of his Father. Dalí senior was a lawyer who supported the work of Anarchist educator Francesc Ferrer, but eventually fell out with his Surrealist son over his penchant for offending and shocking, a penchant that went as far as to send Franco a telegram of congratulations after he executed five prisoners in 1975. Cruel facetiousness or not, Dalí's antics alienated old friends like Miró and Buñuel, who stopped talking to him. This portrait, and another work here, are his only paintings on public view in Barcelona; for more you'll have to go to the Dalí Museum. The museum also has a Picasso portrait of Marie-Thérèse Walter.